They read only nonfiction books. And serious stuff, no fluff. There are just 10 of them. When an opening occurs, a carefully considered replacement receives an invitation. For 23 years, a group of retired UW–Madison professors and administrators has met monthly to discuss works of historic and scholarly import. As book clubs go, it could be one of the world’s smartest. All 10 members hold doctorates. 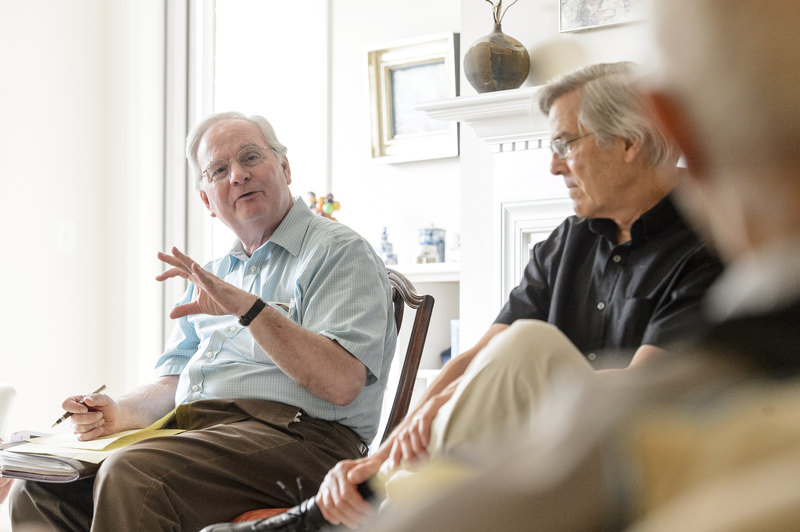 Combined, they’ve written 49 books and taught 332 years on campus. Once a year, the women in the book club invited their husbands to a meeting to socialize. Cohen and Lee Hansen, 89, a professor emeritus of economics, are the only two founding members of the Auxiliary Book Club still active. Donald Downs, the youngest member at 69, got the call to join two years ago. “It’s a friendly group, but also informative and somewhat demanding,” says Downs, a professor emeritus of political science. As befits a group of scholars, club members have kept meticulous records. They have read 221 books, 220 of which have been nonfiction. Their one dip into fiction — the novel “Therapy” by David Lodge in 1996 — ended poorly. In the only other known instance of a novel being discussed, a subgroup once met for lunch to talk about “Stoner” by John Williams. The gathering was unofficial and somewhat clandestine. “We didn’t want to push it on the whole group,” Hansen says. Club members lean heavily toward works of history, politics and science — books like “The Pope and Mussolini” by David Kertzer and “Other Minds: The Octopus, the Sea, and the Deep Origins of Consciousness” by Peter Godfrey-Smith. They were so impressed with historian David McCullough’s “The Path Between the Seas,” a chronicle of the creation of the Panama Canal, that they booked a cruise and sailed the canal themselves eight months later. That’s why their March 2000 meeting unfolded aboard the Sun Princess. Books are chosen by collective vote from recommendations made by members. While an author might consider it an honor to be chosen for discussion by such an austere group, pity the ones whose works come up short. 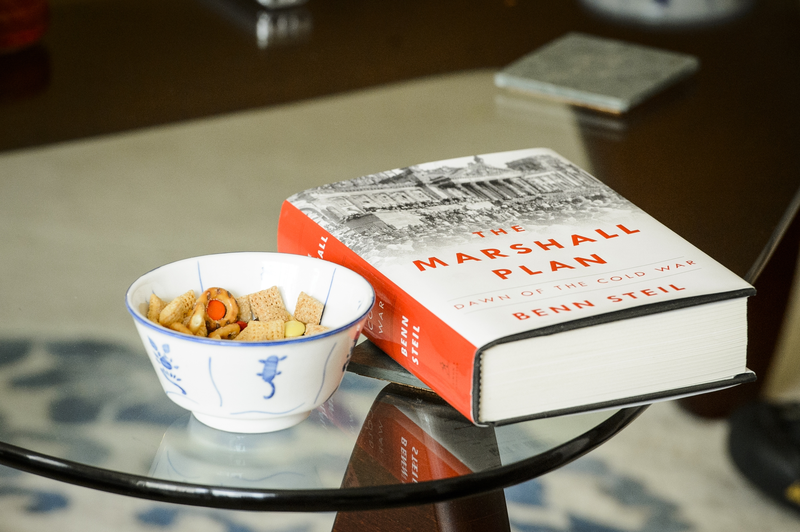 Book club members lean heavily toward works of history, politics and science, like the July selection, “The Marshall Plan” by Benn Steil. At the July meeting, the club dissected “The Marshall Plan: Dawn of the Cold War” by Benn Steil. Cohen hosted and fired the opening shot. Cohen’s comments drew appreciative laughter — he’s known as the toughest critic in the club. “One of Bernie’s specialties, in addition to foreign policy, is finding bad sentences,” Peterson says. Leffler is a stickler when it comes to research methods. His motto: Never unquestioningly trust a secondary source. Steil passed the test. The discussion was robust but friendly. “There are disagreements, but no fights ever break out,” Hansen says. No one can recall a member quitting in a huff. The most common reason for an opening is death, an unavoidable aspect of a club with an average age of 78. Five members have died in the last three years. “One of the reasons the club is so successful is that it helps you make friends with people who can speak at your memorial service,” Snowdon says, to guffaws from his fellow club members. “We’re building up our own burials, and we bury a bunch,” adds Jay Stampen, 80, a professor emeritus of educational leadership and policy analysis. The other current members of the club are Bob Jeanne, 76, a professor emeritus of entomology, and two professors emeriti of political science, Booth Fowler, 78, and John Witte, 72. New members must be approved by everyone in the club. Members say this cautiousness is one explanation for the club’s longevity. Another is the opportunity to engage with respected colleagues from different disciplines.